Another day, another Bedbug heat treat. Here are pics of our technician Brien setting everything up this Friday morning for a bedbug heat treatment in the city of Hemet. Bedbugs are very hard to get rid of. Heat treatments provided by AmeriGuard Pest Defense can kill all of the living bedbugs and their eggs in one service. 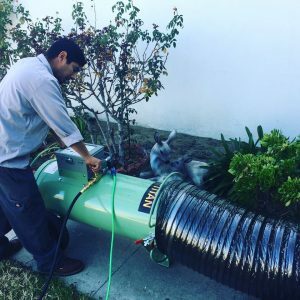 Do not hesitate to call the local pest control professional at AmeriGuard Pest Defense if you live in the Hemet, San Jacinto, Menifee, Murrieta, Temecula, Canyon Lake, Perris, Moreno Valley, Beaumont, Banning and surrounding areas.Make sure to call AmeriGuard Pest Defense today at 951-652-0505 today.